→How to Use Coconut Oil for Effective Acne Treatment? 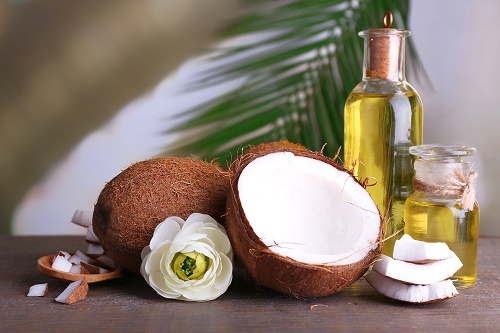 Coconut oil is not only known to make the hairs and skin soft, but it also works magic on acne. So we recommend you to use coconut oil as an effective acne treating agent. How is Coconut Oil Useful as Acne Treatment? The reason coconut oil acne treatment works very well is because the coconut oil is rich in nutrients. Coconut oil is equipped with antibacterial, regenerating and anti-inflammatory properties and thus is good for treating acne. Coconut oil is equipped with a variety of nutritive agents that help combat this condition. It is a source of two most powerful antimicrobial agents generally found in food and these are Lauric Acid and Capric Acid. When applied on skin, the good microbes present on the skin converts them to Monolaurin and Monocaprin respectively which replaces the protective acid layer important to keep the bacteria at bay! Energizing the cells to help expel toxins through the skin. The liver can properly deactivate the androgenic hormones, which regulates the sebum production thus in turn reducing the unnecessary production of oil. Boosting the liver ability to filter out the toxins and prevent buildup of blood toxins and sebum. It is often advised by the doctors to take virgin coconut for raw ingestion as it also has a number of benefits. Penetrating deep into the pores, making them slippery in order to remove the blackheads, whiteheads and acne easily. Calming the sebum secretion and killing the excess acne bacteria to create their balance on the skin with its antimicrobial fatty acids. You can avail the above stated benefits only if you use virgin (unrefined) coconut oil. Why? Here are the reasons! Virgin coconut oil contains 62-64% MCFAs (Medium Chain Fatty Acids) which quickly boost the metabolism of tissues, cells and organs, therefore, strengthen their hormone-regulating and detoxifying abilities. It does not clog pores as it does not get oxidized and become gluey. This is because of the 92% of the saturated fat content. Moreover, it prevents free radicals from attacking your skin and focus on making new skin cells to replace the dead cells along with healing and fading off acne scars. It comprises antimicrobial fatty acids that can easily fight with overgrown acne bacteria, disease causing germs and other harmful microbes present in or on your skin. If you are planning to use coconut oil for the treatment of acne, make sure to choose the highest quality of virgin coconut oil available in the market. Do not go for cheap low quality oil that may contain dust particles that can further aggravate the condition. The first and foremost step is to clean the skin with a gentle cleanser. While doing so, make sure you are using warm water to wash off the face as it will help to open up the pores and clean the mucus and dirt lying deep in the pores. Also, in this way the coconut oil gets absorbed in a better way. Wipe the skin surface clean and take 1 tablespoon of coconut oil on your palm. Massage it gently on your face in light circular motions. Relax for 15 – 20 minutes before washing your face with cool water and cleanser to remove excessive oil. Cool water helps to shrink the pores leaving it less prone to dirt and grime. These three simple steps, followed daily in the evening before bed will help you destroy the acne, blur bruises, and prevent new acne development. At the same time, coconut oil will help smooth and moisturize the skin making it baby soft. With regular application of coconut oil just 20 minutes a day for 30 days, will help you achieve significant results. You will see the difference and its effectiveness in reducing the acne. So if till date, you have been using different products but have still not achieved the results, try coconut oil from now onwards. FYI – Make sure you do not leave coconut oil overnight on sensitive skin. I wish you have smooth skin free of acne that you always wished to have by using pure coconut oil.